capabilities during hand-to-hand combat. It took me several years to develop the answer and it is the SOCP®. The SOCP® Knife has a ribbed ring on the end of a thin, dagger handle so you can grab it with either hand. The sheath extends up the side of the ring making it very difficult for anyone other than the carrier to access. This allows the hand that is holding the knife to transition to a handgun and, most important, there is no disconnect between the knife and gun. The ring enhances the knife, making accessibility easy and fast on the draw. The knife is created with a thin design allowing you to hide it behind a magazine, pouch, or easily conceal it behind a belt with a shirt bloused over. No matter what position you are in, be it standing or on the ground, all you need to do is hook your finger on the ring and the knife is in your hand. Not only is it perfect for concealment, when used effectively, it creates space on the ground. If you are carrying a handgun concealed in a warm climate, it can be hard to get the weapon out fast. If you are grabbed from behind, in a bad position on the ground, or thrown over an object, this knife will help you get to a safe leverage position on an attacker before introducing a firearm. If you transition in a bad leverage position, the firearm may come out of battery. You may not know where the rounds are going. Your retention of the firearm is weak. Using the SOCP® knife makes you safer and more effective at close range. often hindered by environment, physical attributes of you and the attacker, and the sheer skill that is often required to effectively combat a rear grab. 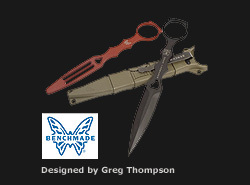 The SOCP® technique links perfectly to the SOCP® Knife. During CQB, situations happen rapidly where a quick response is necessary. Often, soldiers do not prepare effectively for CQB and carry knives in easily visible positions. Attackers can see and easily strike based on the knife location. For example, use of standard Owen knives for overseas CQB has resulted in many documented stabbings that could have been prevented had proper training and weapon placement occurred. CQB also has situations where other problems arise. For instance, a soldier grabs his knife, stabs or cuts the attacker, and yet still fails in his defense because the attacker knows the soldier is going for a handgun during transition. Transition to a handgun, passing a knife between hands, opens up dangerous situations where attackers can use a clinch position to spin and drive a soldier over objects in a room. Rapid access to a firearm is essential in these situations. Being prepared for additional attackers, having mental quickness and physical skills for effective combat is imperative, and ultimately your life could depend on it. A simple blade or knife does not always stop an attacker during hand-to-hand fighting, which is why mental, physical, and tool preparedness is not only mandatory but often lifesaving in CQB situations.